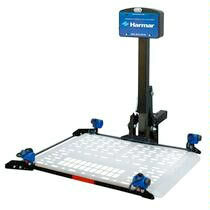 The AL300 from Harmar Mobility is a fully powered lift that rises and lowers with the flip of a switch. This versatile lift will work with both powerchairs and scooters. It features a large aluminum deck, and self-tensioning retractors. The self-tensioning retractors attach to your powerchair or scooter with no need for modifications or drilling. This makes it easy to secure your mobility device for transport. The options swing away mount allows easy access to the cargo area of a van or the trunk of a car. Aluminum Deck Size: 27½" x 39" expandable up to 46"
Hitch Weight 5" - 18"